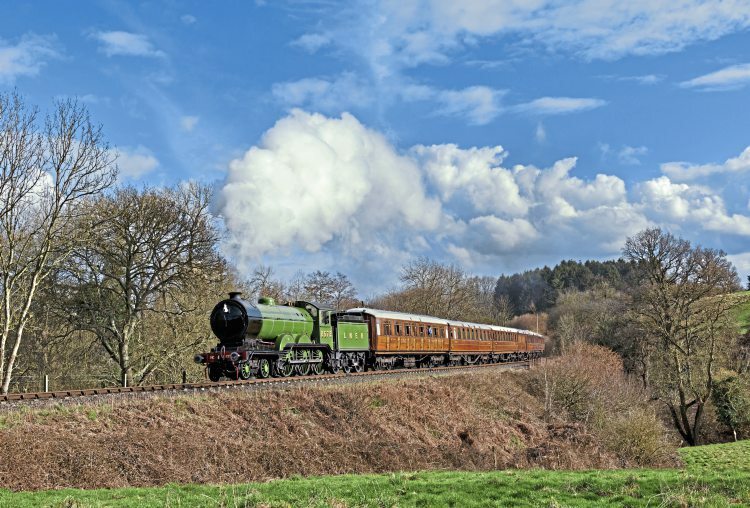 LAST-MINUTE loco unavailability and the reappearance of heavy snow could have spelt disaster for the Severn Valley Railway’s Spring Gala on March 16-18. However, the true spirit of inter-railway co-operation and the efforts of volunteers ensured each challenge was overcome and the event, billed as the SVR’s biggest Spring Gala yet, met with great success. Early doubts over the availability of the Vintage Carriages Trust’s Haydock Foundry 0-6-0WT Bellerophon proved unfounded, but overrunning winter maintenance on Thompson ‘B1’ 4-6-0 No. 1264 did have a knock-on effect. Owners, the Thompson B1 Locomotive Trust, and engineers at the North Yorkshire Moors Railway had tried to get the loco fit to travel south on March 13, but ultimately conceded it was not possible. On March 11, it was announced the newly reliveried ‘B1’ would not be attending the gala, but two days later the SVR revealed the Somerset & Dorset Railway Trust’s ‘7F’ 2-8-0 No. 53808 would not return direct to Somerset after its appearance at the Keighley & Worth Valley Railway gala, and would appear in the ‘B1’s’ in its place. Of the other gala guests, the M&GN Society’s ‘B12’ 4-6-0 No. 8572 and the Great Western Society’s ‘King’ No. 6023 King Edward II arrived at the railway in late February, with Bellerophon and ‘A1’ No. 60163 Tornado following during the second week of March.